What's a pampered cat to do now that she has to compete for attention with an ill-mannered puppy? Award-winning author Susin Nielsen delights in this laugh-a-minute twist on the classic sibling rivalry story. Princess Puffybottom has the perfect life -- her subjects serve her delicious meals, clean up her "delicate matters" and wait on her hand and foot. Life is good . . . until Darryl arrives. Princess Puffybottom thinks he's disgusting, horrid and a true animal. Though she tries everything in her power to banish him (including hypnosis, trickery and even sabotage), it looks like this puppy is here to stay. Can Princess P. and Darryl find a way to co-exist? A hilarious picture book from acclaimed author Susin Nielsen, with adorable illustrations by Olivia Chin Mueller, Princess Puffybottom . 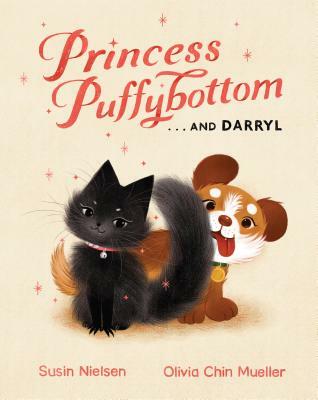 . . and Darryl is perfect for not only warring siblings, but also anyone who loves cute pets (and some toilet humor). SUSIN NIELSEN got her start feeding cast and crew on the popular television series Degrassi Junior High. They hated her food, but they saw a spark in her writing. Nielsen went on to pen sixteen episodes of the hit TV show. Since then, she has written for many Canadian TV series. Nielsen's first two young adult novels, Word Nerd and Dear George Clooney: Please Marry My Mom, won critical acclaim and multiple young readers' choice awards. The Reluctant Journal of Henry K. Larsen won the prestigious Governor General's Literary Award and the Canadian Library Association's Children's Book of the Year. We Are All Made of Molecules was shortlisted for the Governor General's Literary Award, longlisted for the Carnegie Medal and nominated for the Canadian Library Association's Children's Book of the Year. Optimists Die First was nominated for the OLA White Pine Award and the Carnegie Medal, and received four starred reviews. Her most recent novel is No Fixed Address. Nielsen lives in Vancouver with her family and two extremely destructive cats. Visit her at susinnielsen.com; on Facebook at Susin Nielsen, Author; and on Twitter at @susinnielsen. OLIVIA CHIN MUELLER graduated with a BFA from the Rhode Island School of Design. She is the illustrator of A Bedtime Yarn, written by Nicola Winstanley, as well as I am a Puppy and I am a Kitten in the Little Golden Books series. Besides illustrating, Olivia loves playing with her cats, raising silk moths and collecting anything cute! Olivia grew up in the small town of Chester, Connecticut, and now lives in Los Angeles, California.